Fifty years ago this month, all eyes were on Athens. The newly-enthroned King Constantine II of the Hellenes was preparing to marry his eighteen-year-old fiancee (and third cousin), Princess Anne-Marie of Denmark. But although the couple's marriage has been enduring, their reign was not. The Greek monarchy was abolished in 1973, ending Constantine's nine-year kingship. But in exile, Constantine has continued to use his royal title and act as the head of the Greek royal family. He's even continued to award a pair of chivalric orders: the Order of Saints George and Constantine and the Order of Saints Olga and Sophia, worn above by his daughter-in-law, Marie-Chantal. Both orders were created in January 1936 by King George II to commemorate members of the Greek royal family. The Order of Saints George and Constantine, which was only awarded to men, was instituted in memory of King George I (the king's grandfather) and King Constantine I (the king's father). But today, we're going to focus on the corresponding order given to women, the Order of Saints Olga and Sophia. This order was created in memory of Queen Olga (the king's grandmother) and Queen Sophie (the king's mother). Olga and Sophie were some of the most important and influential Greek royal women during the nineteenth and twentieth centuries. Queen Olga was born Grand Duchess Olga Constantinovna, the granddaughter of Czar Nicholas I of Russia. She married the newly-elected Greek king, George (who had been born a Danish prince), in 1867. Russia's support of George had been a key reason for his election as monarch, and his new wife's Romanov ties helped cement that alliance. As queen, Olga engaged in a slate of charity work, supporting orphanages, hospitals, and injured soldiers. Later in her life, she even briefly served as regent in Greece, as the country worked through a complicated series of abdications, referendums, and restorations. Olga's daughter-in-law, Queen Sophie, was born a Prussian princess; she was also the granddaughter of Prince Albert and Queen Victoria. She married the Greek crown prince in 1889, and she became queen consort in 1913 when her father-in-law was assassinated. Sophie's time as queen was fraught with peril and uncertainty. World War I raged all over Europe, and the Greeks were forced to abdicate before eventually reclaiming the throne. Through all of this, however, Sophie joined her mother-in-law in her charitable endeavors. Her grandmother, Queen Victoria, awarded her the Royal Red Cross for her dedication to nursing soldiers during the Greco-Turkish War. Along with commemorating two Greek queens, the order honors two Greek Orthodox saints. St. Olga was a tenth-century princess; St. Sophia, whose name means "wisdom," was the Roman mother who mourned her three daughters (Faith, Hope, and Charity -- also three key religious virtues). The icons of Olga and Sophia appear on the badge of the order, with a white cross in the background. 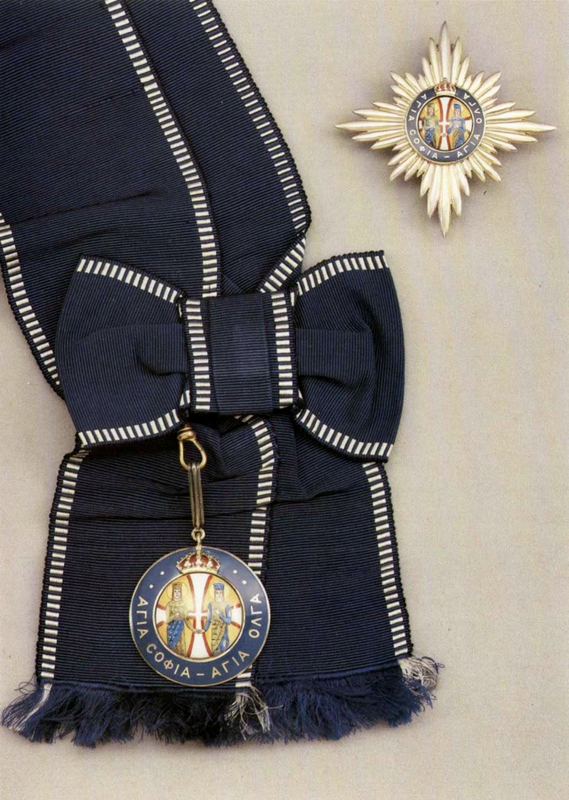 Members of the order can wear the badge attached to a ribbon or a sash. Both the sash and ribbon are navy blue, with a border of navy and white horizontal stripes. The star of the order is silver, with the badge's image set in its center. When he was king, Constantine was the person responsible for awarding the most senior of the Greek chivalric orders, the Order of the Redeemer. But since the 1970s, the Redeemer has been awarded solely by the Greek republic. So when King Constantine gives an order to a royal lady these days, it's the Olga and Sophia, not the Redeemer. For example, the king's elder daughter, Princess Alexia, was born during his reign; because of this, she is a Dame Grand Cross of the Order of the Redeemer and wears the order's pale-blue sash. However, the king's younger daughter, Princess Theodora, was born after the monarchy was abolished, so her highest order is the Order of Saints Olga and Sophia. King Constantine has also bestowed the Order of Saints Olga and Sophie on his two daughters-in-law. Marie-Chantal and Tatiana. When the princesses attend white-tie events -- and because of their enduring ties to the royal families of Denmark, Sweden, Spain, and the United Kingdom, they do so fairly frequently -- they wear the navy-blue sash of the order. The bestowal of this particular order is yet another fascinating aspect of royals post-monarchy -- especially of royals who still use (and, in the case of their Danish titles, legally hold) titles, attend official family functions, and look the part, even without a throne.